On the advent of the release of the third and final installment of The Hobbit films, and in honor of Advent the greater, I’m amused at the giant story of faith sitting hidden in plain sight in the American culture. J.R.R. Tolkien was not only a devout Catholic, he was an evangelist. And his quiet evangelism has shaped a legacy for modern evangelicals in a way that few of us are aware of. If you, on the other side of this screen, are an evangelical Christian in America or Europe, there’s a pretty good likelihood it’s because of the guy who wrote the Hobbit. If you hate evangelical Christians in America, you should likewise hate the guy who wrote the Hobbit (troll that you are). At least I would say that Tragedy is the true form of Drama, its highest function; but the opposite is true of Fairy story. Since we do not appear to possess a word that expresses this opposite—I will call it Eucatastrophe. The eucatastrophic tale is the true form of fairy-tale, and its highest function. He then describes how the gospels are a form of Fairy story, though true, and he calls the resurrection of Jesus a eucatastrophe. I would venture to say that approaching the Christian Story from this direction, it has long been my feeling (a joyous feeling) that God redeemed the corrupt making-creatures, men, in a way fitting to this aspect, as to others, of their strange nature. The Gospels contain a fairy- story, or a story of a larger kind which embraces all the essence of fairy-stories. They contain many marvels—peculiarly artistic, beautiful, and moving: “mythical” in their perfect, self- contained significance; and among the marvels is the greatest and most complete conceivable eucatastrophe. But this story has entered History and the primary world; the desire and aspiration of sub-creation has been raised to the fulfillment of Creation. The Birth of Christ is the eucatastrophe of Man’s history. The Resurrection is the eucatastrophe of the story of the Incarnation. This story begins and ends in joy. It has pre-eminently the “inner consistency of reality.” There is no tale ever told that men would rather find was true, and none which so many sceptical men have accepted as true on its own merits. For the Art of it has the supremely convincing tone of Primary Art, that is, of Creation. To reject it leads either to sadness or to wrath. Now it’s exactly this kind of thinking that Tolkien shared with his friend C.S. Lewis. They both worked at Oxford, Tolkien as a professor and Lewis as a tutor. They gathered together in a pub with friends to drink and read their writings to one another in a group they dubbed The Inklings. And sometimes they strolled down the Addison walk at Magdalen College together. On these treks, Tolkien talked to Lewis, then an atheist, about how God wrote himself into his own story in order to bring redemption out of the tragedy of the human condition – the greatest eucatastrophe of all. 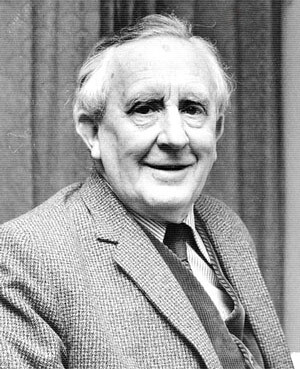 Tolkien was influential in bringing Lewis to faith. Lewis, in turn, encouraged Tolkien to publish his works about hobbits and orcs and dragons. Most people know what a significant influence Lewis has had on Western European and American society through books like Mere Christianity, The Screwtape Letters, and the Chronicles of Narnia. Lewis was a passionate defender of a propagator of the Christian faith after Tolkien helped him get there. Most pastors in America have at least dabbled in Lewis, and to this day it is not uncommon to hear him quoted in the Sunday sermon. His Narnia series alone has sold over 100 million copies, making him one of the most read fiction authors in history. So the quiet little walks with the evangelical Tolkien created one of the greatest evangelists and Christian authors of the 20th century, one who is still shaping preachers and congregations and readers today. So as the Hobbit releases this week, Christians should hail this as the great achievement of one of their direct spiritual ancestors. All the fiery impulse of the good underdog standing up to bullying evil is captured in this Fairy story. And keeping stories like this alive in our culture will always awaken a moral impulse that makes people wonder at the source of good and evil. It makes us long for the triumph of good, for the eucatastrophe of our broken world. Rather than settling for preachy, two-dimensional Christian movies that are painfully overt and poorly written, Christians ought to celebrate works like the Hobbit. And we ought to call attention to the fact that the literary legacy of one of our most devout is now being fawned over by the movie going public on Saturday night, while his spiritual legacy once-removed is still prodding congregations on Sunday morning.